This is Gonna Leave a Mark: What Makes a “Real” Writer? Those who’ve followed my blog long enough know I’m no fan of the Schrodinger’s Writer Game. Is the writer real or unreal? What IS a real writer? For ages, we quibbled that a real writer had an agent. A real writer scored a legacy publishing deal. One had to pass the NYC gatekeepers to be a real writer. Now that writers no longer regard self-pub and indie as publishing mutations that escaped an Amazon basement (mostly), the debate has lost heat. Publishing existentialism is soooo 2013 *flips hair* . Yet, I wonder if this new publishing paradigm is hurting more than helping. And that is a hard thing for me to say since three of the five books I’ve published never would have made it to print if legacy remained the only model. Even though I signed with one of the most prestigious literary agencies in NYC (in 2012), the big publishers regarded a book on author branding and social media with as much enthusiasm as Ebola. Maybe I was ahead of my time. Perhaps the stars were not in alignment. It doesn’t matter. The only thing I know is that I would never have become a “real” writer without the other forms of publishing. Indie and self-pub are highly effective for “test marketing” new concepts, voices, and genres. Alas, despite so many incredible benefits, I’ve been around long enough to see the long-tail. How has the digital age changed the WRITER? Some changes have been for the good. Others? Don’t bode well for our kind. Before anyone gets their knickers in a twist, full disclosure. I might have a finger pointed at y’all, but I also have THREE pointed back at myself. Entropy is alive and well. We all slip if we fail to maintain vigilance. Excellence is tough, and can be easily mistaken for the shill…perfectionism. Seems so simple and yet, it is the hardest part of what we do. I know social media is a powerful tool. TRUST ME, it is why I wrote a book about how to do it well. 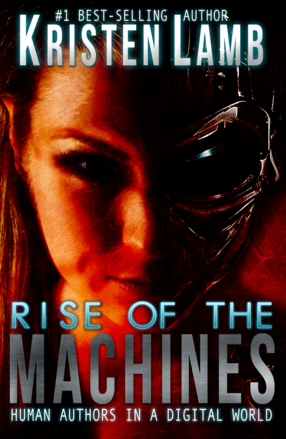 I wrote Rise of the Machines: Human Authors in a Digital World to be evergreen so a writer could build a brand that actually sold books…and have time to do the most important part of our job. WRITE MORE BOOKS. My premise was that, if writers understood people—what makes them tick—then branding and social media is a piece of cake. Why? People don’t change. Read Shakespeare or look up your ex if you don’t believe me. If, however, we writers had to keep up with every time Google tooted a new algorithm, or InstaSnapFace added a gizmo? We’d burn out. Writing good books was tough enough without adding fruitless distractions. I find it comical and depressing that in 2008 I had to BEG writers to even use email. Facebook was the devil and “nobody blogged anymore.” These days? It seems like writers contribute more word count to book spam, current events ranting, and pointless Facebook fights than to their novels. November is the only month I can count on seeing writers actually WRITING a novel. It’s as if we’ve caught digital ADD and have the attention spans of a fruit bat on crystal meth. With self-publishing being an ever-present option, deadlines don’t mean what they used to. Might not mean anything at all, actually. The modern writer must be extremely self-disciplined. I’d venture to say the modern writer has to be even MORE self-disciplined than 15 years ago, because there is no agent that will drop us or publisher who’ll hand us a pink slip if we tweet more than type. The point I want to make here is that the self-discipline required to set aside all other fun and chores to actually finish a book or novel is ridiculous. Rank it up there with running a full marathon or competing in triathlons. But too many “writers” are playing writer. Years ago, when I started blogging, I was unpopular (and probably still an acquired taste). In the early years, I was hard—really hard—on writers, especially anyone who wanted to take a nontraditional path. Our work had to be as good if not BETTER than anything coming out of NYC. Indie and self-publishing could offer us a lot of benefits, but we needed to take the new powers we’d been granted seriously. Many writers did, and that is exactly WHY these routes have thrived. Thing is, I’ve been editing since before the Kindle was invented, and have witnessed a steady decline in the overall quality of writing. What writers deem acceptable to turn in as their best. I regularly run editing specials so writers can get professional feedback on their stories. This saves time and aggravation for a number of reasons. For instance, a writer might be fixing something that isn’t even broken (description) while ignoring serious problem areas (no plot). Or, a writer may possess talent, but be WAY too green to even consider querying let alone publishing. The story might be nebulous when it comes to genre, or breaking genre rules in unforgivable ways. YES, unforgivable ways (like making the love interest the main villain in a category romance). I get many folks don’t care for words like “rules” but rules exist for a reason. RULES help us sell more books. If we have no idea what genre our book even is, how do we sell it? How can we connect it to readers? FYI, rules also keep readers from hurling our books across the room. Yet, the same people who grouse about rules and constraints are often the same ones complaining to me about lackluster book sales. I’ve been running my pages contest (for comments) for ten years now. I’ve discovered no less than six writers with talent who I then connected to agents I knew (who then scored these writers contracts). I do the same sort of scouting with my editing specials. If I see REAL talent and promise? I pass it to an agent (*makes note to ask for commission*). The problem? These days I am lucky if a writer takes time to properly punctuate. I can’t even make it to the STORY because the grammar issues alone are giving me seizures. It’s a profession, not a playpen. Come on….LAUGH! Lighten up 😛 . Writer Unboxed, Jane Friedman, Angela Ackerman and Becca Puglisi over at Writers Helping Writers , Joanna Penn at The Creative Penn, Icy Sedgwick’s Blog, Anne R. Allen’s blog, and Elizabeth Craig’s blog are GOLDMINES of information and professional help. I can never thank all of these people enough for how much they helped ME in my developmental years. How they CONTINUE to inspire me and help me grow as a professional. When I decided to become a “real” writer myself back in the dark ages, publishing hadn’t changed since radio shows were the hottest form of entertainment. Seriously, publishing had NOT changed in almost a century. The formula was exactly the same. Write, query, get rejected, drink heavily, question one’s existence, and try harder. Repeat this process enough and eventually the “publishing gods” might grant favor. I remember breathlessly waiting for the new Writers’ Digest Magazine to hit shelves and hope the magazine was covering something salient to what I wanted to learn or write. I collected dogeared magazines in binders. Gathered photocopied articles, punched holes in them and added them to my resource list. I bought and read every craft book I could find. My personal favorites include (but are not limited to) Les Edgerton’s Hooked, James Scott Bell’s Plot & Structure, Larry Brooks’ Story Engineering, Christopher Vogler’s The Writer’s Journey: Mythic Structure for Writers, Blake Snyder’s Save the Cat, Aristotle’s Poetics, David Mamet’s Three Uses of the Knife: On the Nature and Purpose of Drama , Jack Bickham’s Scene and Structure, Steven Pressfield’s The War of Art, and Donald Maass’ Writing the Breakout Novel. Before Web 2.0, the only way an unpublished “aspiring writer” had a hope of connecting with the pros was to sacrifice and save money to attend a conference. The Internet wasn’t bursting with quality blogs, affordable classes, and on-line conferences or Gabriela Pereira’s amazing DIY MFA. If we wanted to learn from professionals, the price of entry started at around $500. Unless one went for the Old School M.F.A. and that cost the same as a CAR. Yet now that it’s finally affordable and the quality is INCREDIBLE, how much do we take this treasure for granted? Now that becoming a “published author” is so easy anyone can do it, how hungry are we to learn more about the craft? How much time and money are we investing in being better…or even the BEST writers? Not investing in being the best at marketing or promotion, or in learning how to sell books using InstaSnapFace, but the best at telling an amazing story. How much has Web 2.0 made us comfortable, complacent, or dare I say…lazy? So many of the samples I’ve received over the past two years have left me shaking my head wondering if the contributor has ever even read a book. Not only craft books but novels IN the genre they’re writing and—God help us all—the genre where they are publishing. I get it. I’m mean and cruel. Yet, I cannot for the life of me imagine how anyone could be an avid reader and yet have NO idea how to use the most basic punctuation. I understand there are writers with learning disabilities, dyslexia, etc. and we all rely on editors for where we’re weak (and even where we’re strong). We become so immersed in a work we cannot see the forest for the trees and need fresh eyes (skilled fresh eyes). This isn’t what I’m talking about. I’m referring to a blatant disregard for the craft. Yep. This has been me. Because in samples with poor grammar or spotty punctuation, I should at least detect a STORY if this is ONLY a result of being new. In fact I’ve run across samples where authors were weak in technical areas, but showed real promise with a strong storytelling voice. I was willing to invest in developing these writers (and still do) because a) voice usually is a sign the person has at least inherent talent and b) and voice demonstrates a person who might be new, but who READS. They’re willing to honor the profession. Though loathe to mention this, it is not uncommon for me to encounter writers who want to be mega-authors yet will loudly boast they never read books (and don’t even like reading). Brag about never reading craft books. ***So who wants to hire an attorney who brags he’s never read a law book? Just uses Google, trial and error, and is really great at advertising. No takers? This is, in large part, why traditionally published authors suffered such horrific apoplexy in the emerging years of self-publishing. One can only take the likes of John Locke comparing books to cheap cheeseburger so many times before we SNAP. Yet, how much has this mega-capitalization diminished novels as art? We’ve lowered the bar so low most of us no longer can see if one exists. A bar (standard) that once required heroic efforts to hurdle, now? Doesn’t even register as a speed bump. Aaand…this had been me, too. Excuses are for hacks, poseurs and amateurs. Just so y’all know, this is what I say to myself when I hear excuses tumbling from MY lips. So I am no harder on you guys than I am on myself. I don’t serve anything I won’t eat. Yes, life is hard and things happen. Trust me, I get it. For those who don’t know, I’ll be brief. In 2012 I had a very large (but aging) family. We had to RENT space large enough to fit us all. It’s now 2018 and I can count on one hand who’s left. And you should have seen some of the pity parties I’ve thrown. To be clear, I’m not minimizing. Being a caregiver for terminal loved ones is brutal. Death is painful. Losing a job can crack your world in two. Grief and loss should be acknowledged and tended with the greatest care. But I’m all about transparency and so I’ll be honest. I’ve often used my losses as an excuse to hide, my pain as permission to be a pessimist. I spent a long time being—feeling—completely discouraged and STUCK with no clue how to get UNSTUCK. But I’ve learned two crucial lessons in my journey from wanna-be-amateur-know-it-all-hack to being a professional. The lessons? 1) Never underestimate the power of showing up. 2) You can’t DO THIS alone. No, I didn’t have the answers and was hurting but I kept showing up on-line (W.A.N.A.Tribe sprints mostly). There, I had accountability. There were other writers I could encourage or who could even encourage me. I wouldn’t have made it without this strong support system. In the meantime—in the middle of the pain—I kept reading craft books, kept reading authors in all genres, writers far more skilled than I was. Even when it felt like pulling frog’s teeth, I kept blogging, studying, kept doing SOMETHING trusting one day…I’d wriggle free. Pain isn’t permanent and I knew one day I’d heal enough to use it. But I HAD to stay in the game, even if it meant being stationed at the @$$ end of literary left field. Real writers make mistakes. We fail. A lot. If you aren’t failing, it means you’re not doing anything interesting. You’re taking up space. But, while we screw up…we OWN that we screwed up. We admit when we could have done better, then we do. Part of being a REAL writer goes beyond never giving up. We must evolve and grow and learn and improve and that only comes with humility, hard work, and (if we have any sense) professional training. Oh, and a TON of practice. Writing stories. Finishing them. There is nothing wrong with writing for fun, for a hobby. That’s what I do with drawing, painting, knitting and crochet. Dr. Who’s “Empty Child” via K. Lamb. It’s play, a release. But I’m not expecting people to buy my art or my scarves. We need to make a choice. Are we in or out? Stop griping about Amazon and algorithms and how it was so much more awesome before Amazon. Value those who are taking time and investing resources to make us better. Roll up our sleeves and the DO THE WORK. I believe in you guys and I know this transition in publishing has been NO cake walk. There have been times even I wanted to throw in the towel. But most of being successful in anything takes place in the mind because the mind forges the will and will is what yields results. Keep your eyes on the art and remember who you are. You are a REAL WRITER. It’s a CHOICE. Now go check out some of those incredible blogs I linked you to and treat yourself to some books or classes. Sure, I’d love you to take our classes (listed below and on classes page). But, if I’m not offering what fits your needs, go check out the other people I linked to. They’re the best of the best. Invest in yourself for a change. The kids can wait 😛 . Have you grown jaded over the past several years with the changes in publishing? Feel like it doesn’t mean much of anything to be “published writer”? Have you found yourself steadily lowering your own bar without even realizing it? All because it seems TOO MUCH? Hey, I have. No shame here. Are you excited to get back to writing as a craft and an ART? UPCOMING CLASSES! Scroll down or click over to the Classes tab. NEW CLASS! Beta readers are crucial, but how do we find good ones…when they are pretty much as rare as unicorns? Cait is teaching a class on that TOMORROW NIGHT. ***Remember all W.A.N.A. classes come with a FREE recording included in purchase price. Whoever said that writing a book is a solitary job is an idiot. It takes a village (or at the very least a Facebook group, some friends, and possibly a bottle of wine) to write a book. As writers, we need other writers…and non-writers. But, how do we find the right mix of people to support us? What do we do when they don’t? How do we communicate what we need effectively to beta readers and crit partners? And what the heck is an alpha reader? What’s more, how do we take the feedback from beta readers and use it correctly? It’s all too easy to fall into the trap of spinning our wheels on endless edits of the draft of the first draft, to react big and badly to criticism, or to drown in the obligations of reciprocating beta reading for our seventeen new best friends and their manuscripts. Fear not! This class is going to show you how to hunt down beta readers like big game, befriend them in a way that puts Dale Carnegie to shame, and create long-lasting, mutually-beneficial beta and crit partnerships that are so Hufflepuff/Gryffindor, it makes my Slytherin soul cringe. Fish or cut beta: What to do when a beta reader relationship isn’t working – fix, fight, or flight? Gospel vs. grain of salt: How to balance thoughtful consideration of critique with Pavlovian instant tweaking, and why beta readers should never be the one holding the map on the hike. Also, a small house-keeping note: if you’d like to see more of our shenanigans, check out our video page! LEARN TO BE A BRAND BOSS! Can you say “James Patterson”? GOLD LEVEL AVAILABLE: This is you working with me (Kristen Lamb) for 90 minutes building, defining, refining your brand and putting together a PLAN! Time is money and professional consulting saves BOTH. ****A FREE recording is included with purchase of this class. Humans have always been fascinated with what scares them which is why horror fiction is a staple genre. It is also, quite possibly, the most challenging genre to write. Giant bugs and chainsaws just don’t get the screams they used to. Blood, guts, gore and shock factor are low-hanging fruit (and always have been) and worse than that? They simply don’t have the impact they used to. Audiences are too desensitized. This means we need to work harder to dig in and poke at what REALLY frightens/disturbs people. Though this genre is extremely challenging to write well, there is an upside. The horror genre lends itself well to the short form (novellas and short stories). Believe it or not, some of our staple horror movies–and the BEST horror movies—were actually adaptations of short stories and novellas (1408 by Stephen King and Hellbound Heart by Clive Barker being two examples). Meaning, if you want to go Hollywood? Hollywood loooooves horror. The science behind fear and why people crave it. Why fear is even healthy! Psychology of fear, thus how to locate the pain points. Why audiences are craving MORE horror (Yes, this actually does go in cycles). The different types of horror fiction. The importance of character in horror. How horror can actually resonate much like literary fiction. How to generate page-turning tension that will leave readers with a story they can’t stop thinking about…and that might even give them nightmares. It’s one of the universe’s great mysteries… the same word can both boost and drown your book in a category (mind BLOWN, man!). Keywords also seem to evolve every five minutes…or are we the one evolving, like a butterfly having a dream of SEO (trippy, dude!)? Like gravity and Jane Fonda’s hair in ‘Barbarella,’ the popular rules for using keywords value over-inflation and the slavish following of fads. But, like Talbot’s tweed and mother’s pearls, certain marketing strategies and techniques are enduring classics that stand the test of time. They’re not flashy like bellbottoms, nor do they yield dramatic overnight results like ironing your hair. Yet, ignore trends, and we risk getting left behind…kind of like buying electric typewriter ribbon because that whole ‘computer word processing’ thing will never take off. Speculative fiction may be a way of seeing the world ‘through a glass darkly,’ but it can also be one of the clearest, most pointed, and even most disturbing ways of seeing the truth about ourselves and our society. But it’s trickier than it seems to get readers to this intersection without letting them get bogged down in the ‘Swamp of Useless Detail’ or running them into the patch of ‘Here be Hippogriffs’ (when the story is clearly about zombies). How do we create a world that is easy to slip into, absorbingly immersive, yet not distracting from the character arcs and plots? Through the looking glass darkly: How to take a theme/issue/message and create a world that drives it home to the reader. Ray guns and data chips: The art of showing vs. telling in world-building. Fat mirror vs. skinny mirror: What is scarce in the world? Valuable? Forbidden? Illegal? What do people want vs. what they have vs. what they need? Drawing a line in the sand: What are the laws, taboos, limits of this world? What is unacceptable to you/the reader/the character? How are they the same or different, and why it matters. Is Soylent Green gluten-free and other vital questions: All the questions you need to ask about your world, but didn’t know…and how to keep track of all the answers. It’s a time-honored tradition in literature to take an ordinary person out of his or her normal life and throw them into a whirlwind of extraordinary circumstances (zombies/tyrants/elves/mean girls optional). After all, upsetting the Corellian apple cart is what great storytellers do best. It’s also that very same ordinariness and normalcy that first gets the reader to identify then empathize with the characters and stick with them (and the book) through to the end. Our ‘ordinary’ protagonist lives with a chip implant and barcode tattoo, and our antagonist happens to be a horde of flesh-eating aliens…or a quasi-fascist regime bent on enforcing social order, scientific progress above ethics, and strict backyard composting regulations (those MONSTERS!)? How the heck is the reader supposed to identify with that? I mean, seriously. Regulating backyard composting? It would never happen in a free society. This leaves us with two challenges in creating characters for speculative fiction: 1. How to use the speculative world-building to shape the backgrounds, histories, and personalities of characters, and 2. How to balance the speculative and the relatable to create powerful, complex character arcs. Resistance is futile: What does normal look like for the characters? What’s different or strange, and how to get readers to accept that retinal scans and Soylent Green are just par for the course. These aren’t the droids you’re looking for: What are the discordant elements around the characters? What are their opinions about it? What are the accepted consequences or outcomes? You gonna eat that? : Whether it’s running from brain-eating zombies or fighting over dehydrated space rations, what is important both physically and emotionally to the character? What is in short supply or forbidden? We’re all human here (even the ones over there with tentacles): The basic principles and techniques of creating psychological touchpoints readers can identify with. Digging out the implant with a grapefruit spoon: In a speculative world, what are the stakes for the character? The breaking point? The turning point? Speculative fiction is an umbrella term used to describe narrative fiction with supernatural or futuristic elements. This includes but it not necessarily limited to fantasy, science fiction, horror, utopian, dystopian, alternate history, apocalyptic fiction, post-apocalyptic fiction. Basically, all the weird stuff. Gizmos, gadgets, magic, chainsaws, demons, fantastical worlds and creatures are not enough and never have been. Whether our story is set on Planet X, in the sixth dimension of hell, on a parallel world, or on Earth after Amazon Prime gained sentience and enslaved us all, we still must have a core human story that is compelling and relatable. Discovering the core human story problem. How to plot these unique genres. Ways to create dimensional and compelling characters. How to harness the power of fear and use psychology to add depth and layers to our story. How to use world-building to enhance the story, not distract from it. ***A recording of this class is also included with purchase. When: Saturday, September 8, 2018. 10:00 a.m.—6:00 p.m. EST. Kristen Lamb is the author of the definitive guide to social media and branding for authors, Rise of the Machines—Human Authors in a Digital World. She’s also the author of #1 best-selling books We Are Not Alone—The Writer’s Guide to Social Media and Are You There, Blog? It’s Me, Writer. She’s just released her debut thriller The Devil’s Dance.